Genus status. Old name - Mygale. Synonymized genus Scurria C.L. Koch, 1851. The establishment in 2000 by P. Kirk of new taxon P. "hillyardi" from Trivandrum, South India, and also P. "kirki" has not been described and now considered to be the same as the new species, which already described by A. Smith in 2004 - P. hanumavilasumica, found in India during the expedition*. Species ref in hobby and trade as P. bara (or P. subfusca "lowland form") still not valid and is a junior synonym of species P. subfusca, one of it's forms differs in some small details of overall coloration and size. Systematic of this genus still not complete: status of the species P. pococki recently has been discussed and not confirmed by some authors (it was proposed to be a syn. n. of P. smithi Kirk, 1996 but listed at the present as valid taxon) and according to the info from Rick West's site preparing to be resurrected taxon P. vittata Pocock, 1895 (? ), which for now is considered to be synonym of P. striata. The undescribed species known in a pet-trade as Poecilotheria spec. "tigris" has been described in 2006 by A. Smith as P. tigrinawesseli. In 2006 at the end of the year there was also another one specimen being described by Indian arachnologists - Poecilotheria nallamalaiensis Rao et al., eroneusly reffered to the genus comon name as a "parachute spiders", but this description has some very questionable positions of the new spider ID characters, so the further reasearches may change it's brand new status of taxon. Now the scientists P. Kirk and A. Smith (The BTS), and also Rick West (Canada) etc. still working for the genus systematisation. Also Andrew Smith, Ray Gabriel et al. prepare to publish a book about all available Poecilotheria related information. Type species – Mygale fasciata Latreille, 1804. Carapace flattened; fovea weakly denominated, small and straight; ocular tubercle low, more then two times longer when wider; eyes of the anterior line are similar, curved; the outer surface of the mandible in its lower part furnished with big quantity of short spines; maxilla with several spines arranged in one row, surrounded with one or several black teeth-like tubercle; between spin`row and sutur possess a fringe of setae; legs without spines, scopula of legs are clearly seen; stridulation apparatus consists of row of spines or spin-like setae at the ventral surface of the mandible and rows or bunches of vibratil setae, laying on maxilla of palp; tibial spurs are absent; urticatings hair on the abdomen is absent. Also, it was noticed that all Poecilotheria spp. have unique colour patterns of the ventral part of the body (especially legs), which can allow for species identification (see table by Soren Rafn). First known species of the genus was described by Latreille as Mygale fasciata and based on the diagnosis of the big tarantula named Aranea maxima ceilonica. С. Coch in 1850, was the first who separate genus Mygale, of Latreille and Walkenear, by renaming that tarantula from the Ceylon to Scurria. But this name was 3 years earlier registered for genus of mollusc which why Eugen Simon in 1885 proposed to rename Scurria in Poecilotheria. Till 1885 genus Poecilotheria, was monotypic, consists of the single species - P. fasciata, and considered distribution specific to Ceylon (Sri-Lanka). In 1885 Eugen Simon has public the description of the tarantula form Ramnad, Madura region in South India. 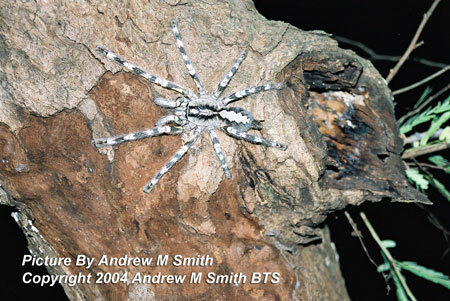 But accuracy of this description not allows referring this species to Poecilotheria genus. Just at the beginning of 1895 Reginald I. Pocock, during his study of material in British museum, found two clearly different species - one from the Ceylon, the other - from South India. They were described as P. subfusca and P. striata. During the year 1898 British museum receive from Mr. Carter which were a new species of Poecilotheria and was described later. At present time, in connection with popularization of Asian tarantulas among collectors, representatives of this genus are actively reproduced in captivity and became more common in collections. Also with the purpose of studying biology and detection of new species expeditions goes to India and Sri Lanka. At the same time sharply increased popularuty of representatives of this genust in sphere of international trade causes the serious concern among scientists. In April 10-20, 2000, in Nairobi (Kenya) there was an 11 meeting of CITES parties, considering as one of the including questions the proposition of USA and Sri Lanka parties about enabling the tarantulas of genus Poecilotheria in Annex II of the Convention. However this offer was rejected. Now the genus is represented by 16 effective, large, extraordinary popular recently among collectors leading arboreal lifestile tarantulas. Due to motley colouring of legs and ornamental figure on abdomen and carapace they were named "ornamental tarantulas". Species as P. regalis, P. formosa, P. subfusca, P. metallica and P. ornata have some color variations. In a nature they were found in xeric or mesic montane forests and plantations. Live in silken retreats in hollows of dead and alive trees and other covertures, as a rule, located above the ground natural retreats. Herewith two species - P. fasciata and P. regalis inhabitig more xeric areas, than others. It is interesting, that young spiders live near the ground, pull out small burrows and at the slightest danger are hidden in them. Also there are separate analog messages concerning adult spiders. These are extremely mobile, fast and aggressive tarantulas, which bite considering the extremely painful. They capable rapidly to move and jump on enough greater distances. Comparatively these tarantulas, either as representatives of genus Avicularia there is known confirmed information on their communal lifestyle in nature in one covertures. Herewith noted finding together in one retreats both specimens of younger ages, as well as and spiders of different ages. This information has been proved for P. regalis and P. subfusca. P. formosa also is an object of tarantulas communal keeping in terrariums. However, in spite of the fact that a number of amateurs in the world keep for a long time in one terrariums of several specimens of different ages and species of Poecilotheria the risk of cannibalism remains enough high. Spiderlings grow very quickly and reach sexual maturity within 1,5-2 year and maybe earlier bieng power-growing. Lifespan of all species of genus Poecilotheria amongst world fauna of tarantulas has quite not big parameters - 8-12 years (separate specimens in amateur`s collections). In nature lifespan of ornamental tarantulas have short life spans: 12-15 months for male maturation and 14-18 months for female maturation with an average postadult female age of 60-85 months. Female usually produces about 100 eggs in a cocoon. It is notable the presence of sexual dimorphism amongst Poecilotheria (beside absolute majority of tarantulas is absent). Herewith if, for example, undersite colouration of both sexes similar, that overall coloration of males has been more unicolored and "ornament" much weak denominated. They also resemble the coloration of females in development of bands of legs femur, but differs in proportions of ratio of legs and a body. Keeping conditions. Certainly, are one of the most popular and widespread arboreal tarantulas among amateurs of the world. In captivity require ample vertical box (terrarium) with big surface of walls with account that they reach 18-20 cm in legspan. Walls may be decorated by a wood bark (cork bark, amur velvet, etc). Installation in the terrarium of alive plants is not expedient since all species have tendency to plait them by web, though and not as much as representatives of genus Avicularia, for instance. Terrarium for all species must be provided with good ventilation. As for temperament of these tarantulas, follows to say that such species as P. fasciata and P. ornata are an most aggressive representatives of genus for keeping in captivity. Tarantulas P. regalis and particularly P. miranda may be kept even not very experienced, but already having a certain experience amateur, as they are "quietest" species and not inclined to attack instead of that prefer to hide being disturbed. All species as a whole can be kept in the same conditions under average moisture and temperature level, with rare exception (see species descriptions). In general this is not a begginers species and can't be recomended for them to keep, since they're dangerous, toxic and non-predictable. Distribution. Representatives of genus Poecilotheria are known only from the territory of South and Central Sri-Lanka and also from India. Information on finding of these spiders outside of specified territory not confirmed. In whole, a number of Poecilotheria spp. in nature grows shorter because of deforestation (firstly of primary forests) and low ability of adaptation to anthropogen factors (Kirk, Charpentier (1996). Widespread presented in hobby and also one of the most large species - 17-20 cm in legspan. These spiders, as well as other representatives of genus are very aggressive, that requires caution in manipulation with them. Requires maintenances of humidity about 75-80%, temperature 25-27°С, substratum layer 4-5 см. In Salem known from Kadinmpatti and Mullapuram. It is considering that the venom of this species potentially the most harmful for human amongst other Poecilotheria species. It is for the first time was found in 2001 by canadian scientist-arachnologiest Rick West within 102 years after its description. Beautiful, seldom meeting in nature species, having very limited areal. The most large representative of the genus, reaches 7-8 cm of body length and 20-23 cm in legspan! One of the most widespread representative of genus in hobby. Also one of the most widespread and regularly bred representative of genus in hobby. Reaches 7 cm in body length and till 18 cm in legspan. Together with P. ornata are most large species of genus. Reaches 7-8 cm in body length and 19-21 cm in legspan. Reaches 15-17 cm in legspan. Inhabiting mountain forests of Sri Lanka (known from Peradenia and Pundaloia). Bred and sold in captivity for last 2 years. In nature often inhabits the same areas as P. miranda.